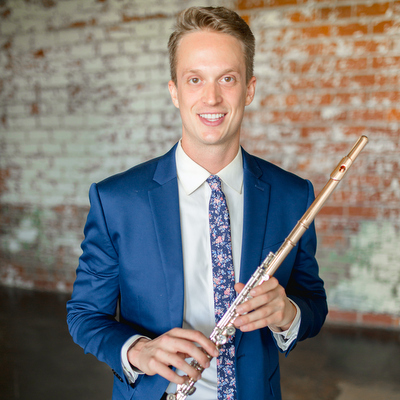 Houston-based flutist Douglas DeVries is currently a Da Camera Young Artist and a frequent guest principal flute of the Kaleidoscope Chamber Orchestra in Los Angeles. He is also the solo flutist of Loop38, a contemporary music collective in Houston, as well as an adjunct instructor at Houston Community College. In addition, Mr. DeVries performs regularly with the Louisiana Philharmonic Orchestra in New Orleans, the San Antonio Symphony, the Chattanooga Symphony, and the New World Symphony in Miami Beach. He was a winner of From the Top’s Jack Kent Cooke $10,000 Young Artist Award, and a prize winner at the Houston Flute Club’s Byron Hester Young Artist Competition and the Seattle Flute Society’s Young Artist Competition. Highlights from recent seasons include performances with the Los Angeles Philharmonic at the Hollywood Bowl, a tour to Royal Albert Hall for the BBC Proms, a performance of Mozart’s Flute Concerto at the Vermont Mozart Festival, and orchestral performances and solo recitals at Carnegie Hall, The Menil Collection, and Central Presbyterian Church in New York City. Mr. DeVries received his Bachelor of Music degree from The Juilliard School as a student of Jeffrey Khaner, and his Master of Music degree from Rice University’s Shepherd School of Music, where he studied with Leone Buyse.